By the end of this exercise you will know how to post and contribute to issues in the Drupal issue queue. Project maintainers can spend a lot of time understanding the details of an issue and reproducing reported bugs. By confirming that a bug can be reproduced and improving/writing issue summaries, you help maintainers more efficiently diagnose and respond to bug reports. This exercise will help you gain Drupal sitebuilding/coding experience. Working on core issues introduces you to things such as the user interface, file structure, feature sets, etc. It offers a great learning experience while providing a significant service to the community. In this exercise we will start by creating a very basic issue, which is sufficient, but not ideal. Then we will test the issue, and follow up and improve the issue to make it more complete. For more background on the issue queue, and how to correctly fill out an issue form, please read the Drupal.org documentation, Making an issue report. There is also a short video, Getting started in the issue queue, which walks through this lesson and includes some background information on the issue queue. Installed Drupal 8, current release, to your system. Go to the Drupal 8 Sandbox issue queue and click the option to Create a new issue. Click Save. You now know how to post an issue to a drupal.org issue queue. You'll be working with a sandbox version of Drupal that has been built with a known issue in this exercise. For this lesson, download and install the sandbox version of Drupal 8 Drupal 8 Sandbox for Drupal Ladder. Note: This is not a duplicate of the previous lesson. The previous lesson taught you how to do a clean/real install of Drupal 8. 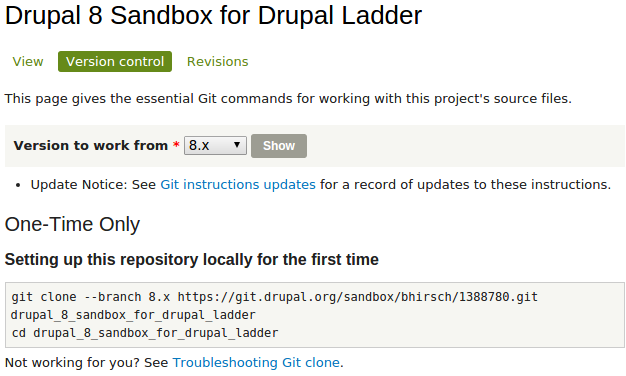 Browse to your Drupal Ladder sandbox on your computer, which was setup in the previous step, and find the bug you've posted in the issue queue in your site. Post a comment to your issue indicating whether you were able or unable to reproduce the bug (in this case, whether you found the confusing text and agree that the proposed alternative is better). Include documentation about how to reproduce the bug (e.g. "create a new piece of content, scroll down and click the URL settings tab to locate the help text"). Finally, upload a screen shot with an arrow, circle, or some sort of highlighting that shows other readers what needs to be fixed. There's a list of Novice bugs on drupal.org that are supposed to be good for beginners. When working on real, unresolved issues, double check if this bug has been reported or resolved elsewhere. If it has, change the issue's to status "closed (duplicate)" and post a link to the duplicated issue. For someone walking through this ladder and relying only on the information provided so far, Step 2 under "Confirm a reported bug and improve the issue" might need a bit of clarification. While it is fairly simple to do, someone using dev desktop and git for the first time might not understand that they need to create a new folder, navigate to it the copy and paste the "git clone" command on the "View" tab of the referenced page, then Import the site through the dev desktop. Hello, It felt like I had difficulty with the expectations of the 'instructor' here. Link back to Step One in the ladder to emphasis the need to completely repeat this step with the Sandbox version. Link to the real issue ought to be emphasized as this was the key to understanding the task. To install the Drupal 8 Sandbox distribution, open a command prompt in the web root used by your Acquia Dev Desktop installation (e.g. /home/[username]/Sites/devdesktop). Once the cloning is done, add the distribution to your Acquia Dev Desktop using the "Import local Drupal site..." option. Click the Dev Desktop "Local site:" link to proceed with the Drupal installation. Additionally, I suggest adding a step to "Confirm a reported bug and improve the issue" to return to the Issue Queue and assign the issue to yourself. Contributors should be in the habit of assigning/unassigning issues to oneself so other contributors can identify those that are not actively being worked. Adding option of creating patch. In Confirm a reported bug and improve the issue section after step #4 we can add few steps more which will help student to execrise writing a patch. 5. Now find the file that cointans this help text. In this case the file can be found at "core/modules/path/path.module". Locate the line which makes description for URL. (You can find that line inside function path_form_node_form_alter(&$form, $form_state) ). Edit the description for the same with the proposed one and generate the patch. If you are new to creating a patch you may like to refer to Creating a patch. 6. Now go to update the summary option. Change status to need review. Add a good comment as to what changes you made in your patch. Upload your .patch file. 7. Click on Save.You will now see that status has been changed to "Needs Review" and your patch will be tested according to Drupal Standards.